Ricardo is the Executive Director of the Hispanic Affairs Project, a Chinook Fund grantee, and a founder member of this organization in 2006. He has over twenty five years of experience working as a community organizer and leadership development trainer for community projects and social justice institutions in El Salvador, Guatemala and the United States. Ricardo was born in El Salvador where he participated in the social movement. Before coming to the USA, he worked for 8 years as a Technical Coordinator in local/regional projects working on national reconstruction. He gained a great deal of experience in municipal government, public administration and program implementation for social, economic, infrastructural and environmental projects. His educational background includes a Bachelor’s Degree in Philosophy and a Master’s Degree in the Latin-American Theology with other studies in social planning, social research methodology, popular education and local sustainable development. 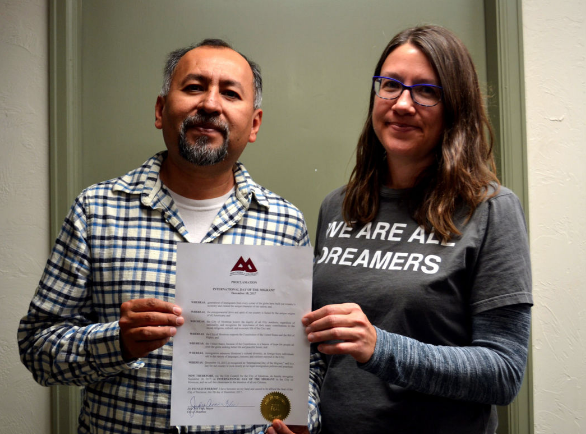 In 2011, he received the Immigrant Liberty Award from Colorado Chapter of the America Immigration Lawyer Association, AILA for his commitment to the immigrant rights movement. Currently, he collaborates with other regional, state and national boards and committees working for social justice. What is Hispanic Affairs Project? HAP is an instrument to organize the base in western Colorado. HAP was created by impacted people opting to fight for their rights. The mission of HAP is to provide leadership development before anything else. In 2005 we had the chance to organize the base around the McCain-Kennedy proposal for immigration reform, organizing the biggest public demonstration in the history of Grand Junction. It was remarkable to see the immigrant community marching and voicing a desire for political change. Unfortunately, time passed and the reform never came. But in this effort, we learned that we can make a change if we identify ourselves as part of the social movement and to learn from and create connections with other progressives; Cesar Chavez, Black Panthers, and other progressive groups in our region. Today, HAP enjoys the recognition of progressive groups in western Colorado and views these connections as a key component to organizing and movement building. When did your group come together and why? HAP was created in 2005 by Hispanic immigrant leaders of the communities in Grand Junction, Delta, Olathe, Montrose and Hotchkiss who had participated in adult faith formation programswithin the Catholic Church. In light of the changing population dynamics, these leaders recognized the importance of addressing the needs of the new Hispanic immigrant community in the region. First generation immigrant leaders from these communities organized themselves to expand their work to include all people affected by the challenges facing immigrant families, especially the lack of integration, social inequalities and few opportunities for social development. Over the last two years, HAP has developed a more stable infrastructure after receiving its 501c3 nonprofit status in March of 2010, elaborating a 5-year strategic plan, and expanding its capacity for new financial development. HAP is the only organization in the region made up entirely of first generation Hispanic immigrants and is recognized by local community organizations for defending the rights of all immigrants. How is the current political climate affecting your work and community? There are more cases of deportation. Seeing ICE in court and other public spaces is scaring families. The Dreamers in our community seem hopeless and disillusioned, they are not participating in our programs as they have before. On the positive side, there has been an increase in support and solidarity from our ally’s in the community. 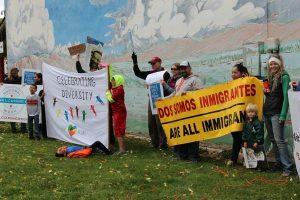 Grand Junction recently had the biggest collaborative in its’ history at the Western Colorado Days of Action, and the main topic issue was immigration. It was amazing to see unions, farmers, students, churches, environmentalists, social justice advocates, small initiatives, and other nonprofits coming together in support of the immigrant community. Unfortunately, we haven’t seen the same type of response and motivation coming from within our community. I think a lot of people are afraid to organize right now. Can you talk a bit about the new programs you’ve established in response to the sweeping immigration reforms we’re experiencing? We discovered that the highest rates of police presence in low income neighborhoods is due to interfamily incidents. Recognizing that the Hispanic community has a high rate of incidents of domestic violence, we set out to prevent that. We currently lead ‘Know Your Rights’ training in neighborhoods and have included conversation about how to address cases of domestic violence and sexual assault, most prominently on how to report the crime in a way that will not cause an immigration issue. We are currently working in collaboration with Latino Community Foundation, the University of Denver and three other rural organizations on the issue of mental health in our community. We are working together to build a plan to address the lack of access Latinos have to mental health services in western Colorado, and the lack of cultural competency in the few mental health centers that do exist in the area. After the election, we also began to develop a deeper understanding of the political system in the US and how to use it. We fostered great relationships with local agencies and governmental entities across the region. For example, we received a lot of support from police departments in Montrose, Gunnison, Delta and Grand Junction to provide ‘Know Your Rights’ trainings. It was exceptional to have police officers explaining to our community how to protect themselves from police abuse, and especially from ICE. This is still happening today. Little by little we are promoting policies in our local institutions, to create a more inclusive environment for minority groups. What are a couple of things people can do to support this work? The society is divided and we need to move on a local level if we want to see real change. Educate yourself and others about immigrants and immigration, talk with local leaders about advocating for minority groups, and hold your representatives accountable by participating in the upcoming election.